Iran is determined to increase its investment in tourism after authorities registered a significant rise of visitors that is mostly linked to President Rouhani’s approach with the Western world that is very distinct from his predecessor, Mahmoud Ahmadinejad. The Director of Iran’s Cultural Heritage, Tourism and Handicrafts Organization (CHTHO), Masoud Soltanifar, has announced that $220million will be invested in the construction of hotels, guest houses, and accommodation camps across the country. The money will be separated between 30projects. The organization has already secured funding. The National Development Fund will provide financing for the projects. Credits are being given to President Rouhani for his efforts to mend relations with the West. They believe that the arrival of tourists in the country increased due to the latter’s effort. For the first time since the Islamic Revolution of 1979, international hotel chains are now plotting a return, while European airlines are adding or restoring links with Tehran. However, an agreement is yet to be reached between the negotiating parties on the controversial Iranian nuclear plant. 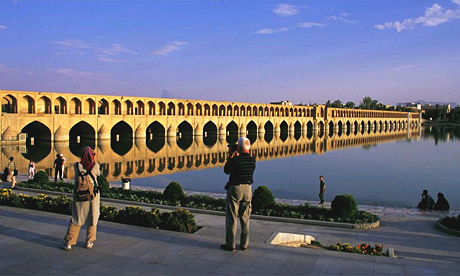 2014 is already proving to be a prosperous year after the Deputy Director of the Cultural Heritage, Tourism and Handicrafts Organization, Morteza Rahmani-Movahed, revealed that “over 23,600 foreign tourists visited Iran in the three-month (Soring) period, compared with 7,500 last year.” The country registered a rise of foreign tourists by almost 215% in the spring period of 2014 when compared to 2013. Iranian First Vice President Es’haq Jahangiri did signal that the government is working on a policy that could ease the pressure on the sanction-hit economy. Among the factors that government is planning to introduce to lure investors include low-interest loans, plots of land, and facilities to establish hotels. The country earned $5billion from tourism last year. Posted by Geraldine Boechat on October 13, 2014. Filed under Business, News. You can follow any responses to this entry through the RSS 2.0. You can skip to the end and leave a response. Pinging is currently not allowed.